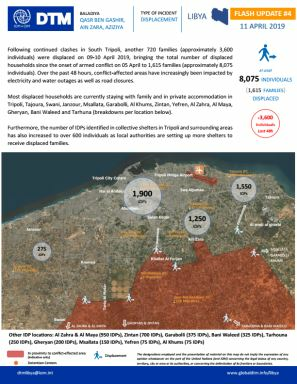 The 24th round of DTM data collection in Libya took place in January and February 2019. 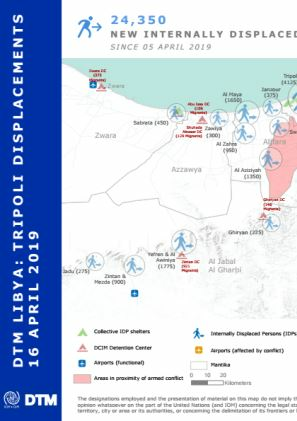 DTM identified at least 666,717 migrants currently present in Libya. Migrants were identified in all 100 municipalities, within 570 communities and originated from more than 38 countries. 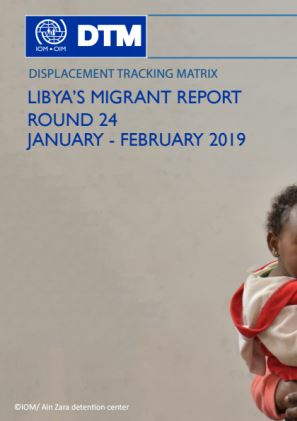 This edition of DTM’s Migrant Report includes a new health surveillance component integrated under the Flow Monitoring Survey methodology to better understand the health conditions and challenges migrants face in Libya, please refer to page 15 for more details. 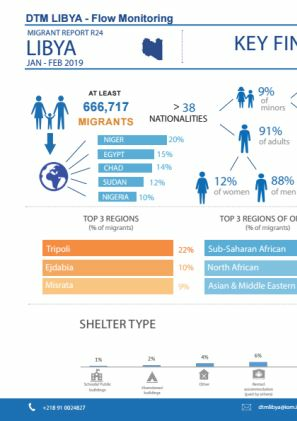 Out of the total number of migrants identified, 626,627 individuals (94%) originated from 27 different African countries while 39,716 individuals (6%) came from 10 Asian and Middle Eastern countries. The remaining 374 individuals were recorded as of unknown nationality and / or other country of origin.